The hype around wearables is deafening. I say this from the perspective of someone who saw their application in chronic illness management 15 years ago. Of course, at that time, it was less about wearables and more about sensors in the home, but the concept was the same. Over the years, we’ve seen growing signs that wearables were going to be all the rage. In 2005, we adopted the moniker ‘Connected Health’ and the slogan, “Bring health care into the day-to-day lives of our patients,” shortly thereafter. About 18 months ago, we launched Wellocracy, in an effort to educate consumers about the power of self-tracking as a tool for health improvement. All of this attention to wearables warms my heart. In fact, Fitbit (the Kleenex of the industry) is rumored to be going public in the near future. So when the headline, “Here’s Proof that Pricey Fitness Wearables Really Aren’t Worth It,” came through on the Huffington Post this week, I had to click through and see what was going on. Low and behold this catchy headline was referring to a study by some friends (and very esteemed colleagues) from the University of Pennsylvania, Mitesh Patel and Kevin Volpp. Other authors were Meredith Case and Holland Burwick. Also notable was that the study was published in JAMA. In this research letter, the authors compared several fitness wearables to smartphone-based apps as tools to track activity. They asked healthy volunteers to walk either 500 steps or 1,500 steps on a treadmill, and compared step counts on multiple devices as well as on smartphone pedometer apps. It is worth spending some time reviewing their data tables. The first take-home for me was that steps counted on the wearable devices and the mobile apps, when walking on a treadmill, are pretty accurate. I was somewhat chagrined to learn this. 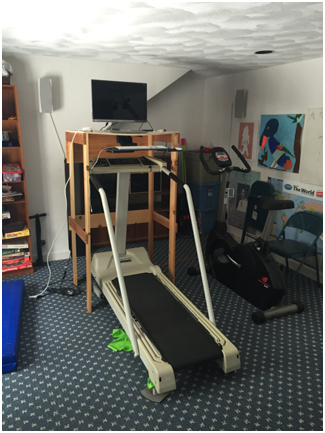 I have a treadmill desk and this time of year spend many evenings walking while reading email. It always seems like I’m walking farther than the Fitbit tells me, but now I know I’m probably just tired at that hour. Their main point, however, is that smartphone apps are as accurate as these wearable devices. This makes sense intuitively, as we’ve known that smartphones have embedded accelerometers, which can be used to track the movement of the phone. For years, there have been apps that can take this data and, by applying some software algorithms, show activity that the phone has traveled as steps walked by the owner. I believe they were initially not so accurate. However, a bigger problem in the early days was that these apps drained the phone’s battery because the processor always needed to be on while tracking the accelerometer’s activity. This has been remedied in the most recent generation of mobile phones, as they now have separate processors dedicated to this sort of continuous tracking. Thus, we have plentiful pedometer apps (a search on the Apple App store produced too many to count). We’ve also solved how to run these apps in the background without disrupting the phone tasks or draining the battery. So, is it time to ask, “do we really need fitness wearables anymore”? I’d frame the question a different way. Is the future of patient-generated data migrating to the mobile phone (the proverbial digital Swiss Army Knife of life) or will it be migrating to the realm of micro-sized wearable seeds, ingestibles, injectables, bandaids and the like? I was a fellow panelist with tech guru and futurist Nicholas Negroponte, and in an off-handed comment, he said that wearables are just a temporary fad and that the future is in ingestibles. On the one hand, it’s tempting to think about a world where all of your health-related data are generated on and analyzed by software resident on your mobile device. One big challenge to this vision is that we don’t always have our phones on our person. Some folks carry them in a bag, etc. This latter point calls into question the experiment that our friends at Penn did and, more impressively, that JAMA chose to publish it. The quality of the science is quite high but the applicability is questionable. Also, there are many other health sensing applications than just pure activity tracking. What about continuous heart rate or blood pressure monitoring? It’s hard to imagine getting those done without some sort of sensor. Going back to the eye-catching headline from the Huffington Post and channeling Mark Twain, I’d have to say that reports of the death of wearables have been greatly exaggerated. The power of sensor-generated data in personal health and chronic illness management is simply too powerful to ignore. The last point to be made, however, is that wearables and their attendant feedback loops are relatively weak motivators on their own. In fact, the same group from Penn came out with an opinion piece, also in JAMA one week earlier, thoughtfully talking about this point. Our Connected Health research team at Partners HealthCare has shown repeatedly that the motivational messaging that puts these feedback loops in context is the true driver of behavior change. That will no doubt be delivered via your smartphone!